The year was 2004 and our founder Tyler Shearburn was looking for something ultra comfortable to complete his newly designed home theater room. He visited many high-end furniture retailers to check out the latest in home theater seating. Technology had increased so much in the home theater industry over the years and with all the new top-of-the-line LCDs and plasma televisions, the furniture industry also appeared to have 'stepped up its game,' so to speak. Home theater furniture could do just about anything you wanted. There were built-in heating and cooling seats, coolers built into the console and power recline. Even with all the bells and whistles, there was one really big problem; they were not comfortable. It was like being in a really high-end sports car, only the seats felt like you were sitting on a wooden board. They looked really cool, but who wants to sit on something uncomfortable for a couple hours watching a movie? With a price tag of about $3,000 for each home theater seat, this did not seem like the best option, so Tyler continued his search. Tyler visited even more furniture stores determined to find something that looked beautiful but was also ultra comfy. He found a high-quality plush couch that would work well but it was not the missing piece he needed to complete his home theater set-up. It was back to the furniture stores to find the missing piece. Maybe a nice love seat or recliner would work. At a local mall, he discovered a product called a LoveSac. It was a giant bean bag filled with some kind of shredded foam and was fairly comfortable. It seemed to be a nice chair to sit in but he wanted something that could also be used to lie down. He was looking for a specific color to match his sofa, but that color was not available. Tyler was looking for something a bit longer and more oblong. After some discussion with the salesperson, he found out that Lovesac didn't sell a product like that and the price tag of the displayed product he had been sitting on was in excess of $1,200….yikes! 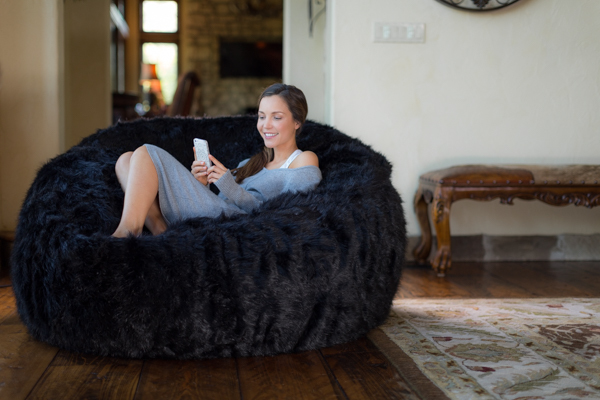 When Tyler got home, he jumped on the Internet to search for something similar to the Lovesac. He was looking for a product with great reviews, a larger variety of sizes and fabrics and above all, a more reasonable price. After some serious searching, it was pretty clear that this product didn't exist. That’s when Tyler decided if it didn't exist, he would create it. The Comfy Sack was born. Offer a huge selection of fabrics and colors and create a lounger series of products that would allow people to not only sit upright but also lay down for ultimate relaxation. Create a website that was both easy to use and showed the customers exactly the product they were purchasing. Other websites selling competing products at higher price points were very tough to navigate and forced you to look at a small swatch of fabric on the screen and 'imagine' that color on the picture of the product featured on the site. Consistently manufacture products that were both ultra soft, ultra durable (see Comfy Sack vs. Tank video) for a great price. Provide excellent customer service and with local staff who possessed in depth knowledge about the product. The website ComfySacks.com launched in late 2005 and over the next few years, nothing short of a phenomenon occurred. What started out as a product geared toward home theater enthusiasts evolved into a product enjoyed by all types of awesome individuals. 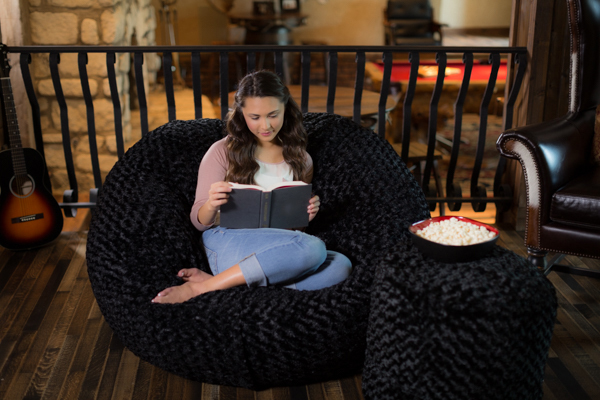 College students loved them for their dorm rooms; families loved them for movie nights; schools loved the washability of Comfy Sacks for their schools and libraries. The functionality of the product was also really embraced by special needs organizations. By 2010, companies including Apple, Amazon, Zazzle and Zappos had Comfy Sacks in their corporate headquarters. These companies were looking for something that fit their company ethos. They are 'Work Hard - Play Hard' companies and they wanted something both comfortable and a bit edgy for their breakout rooms and creative think tank areas. Tyler met with these organizations to determine the right sizes that would work best in their environments. Oftentimes, interior design firms were involved in the meetings. The decorators provided incredible insights about making the Comfy Sacks really part of the work environment. They were all great companies to work with; it was clear why each has been so successful. Above all, they valued their employees and wanted to make the workplace somewhere they forward to going to each day. We were thrilled to be a part of making employees’ lives just a little more comfy! Today, there are close to 150,000 lbs of Comfy Sack products in these organizations….that a lot of beans bags! Tyler is a passionate traveller, because of that, ComfySacks has been able to expand globally. Our chairs are sold in a number of countries in Latin America and as far as Australia. Our goal continues to be the same as when the company began. We offer an ultra-comfortable, durable and long-lasting product at a competitive price, all while providing an incredible customer experience. Our promise is that we will continue to work our hardest to provide these things to every person who visits our website. We look forward to delivering on that promise to you! Order Your Comfy Sack Today!